GET VOTING!. 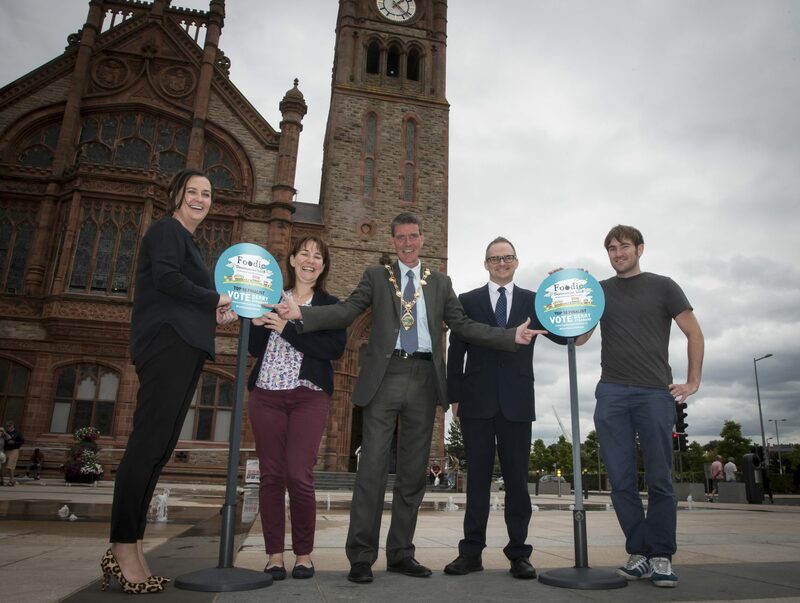 . . .The Mayor, Councillor John Boyle pictured at the launch of the Foodie Destinations 2018 Voting Call for Derry outside the city’s Guildhall on Tuesday morning. The city has been included in the top 10 finalists. 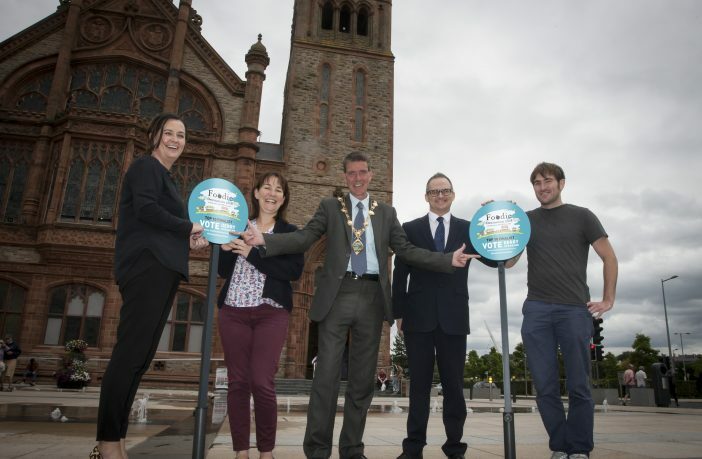 Included from left are Catherine Goligher, Tourism Officer, Derry City and Strabane District Council, Aideen McCarter, Head of Culture, DCSDC, Mark Toye, General Manager, Bishop’s Gate Hotel and Stephen Forbes, Mekong. News that Derry City and Strabane District Council has been selected as a top 10 finalist for Foodie Destinations 2018, has been warmly welcomed by the Mayor Cllr John Boyle. Mayor Boyle, urging people to vote to help secure the title, said: “Securing the Foodie Destination accolade would be a hugely significant coup for the city and for everyone involved in the local food and tourism industry. It is a tremendous achievement for the city to have got so far in the competition and shortlisted among ten foodie locations across the country all vying for top position on the food tourism map. “I think we are truly deserving of this prestigious title. Over the years, our food and tourism offering has increased and improved significantly. The city has fast established itself as one of the best food destinations in Ireland. We enjoy some of the finest local produce right on our doorstep with fresh fish from the Atlantic Ocean and locally produced beef matched by the creative culinary talent in our restaurant kitchens. 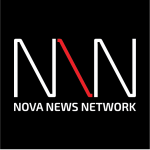 To win this award would be amazing for the city, not only for our tourism industry but in terms of confidence and pride for our local chefs, hoteliers, food producers and tourism providers,” he added. Derry City and Strabane District Council is leading the campaign to become Foodie Destination of Ireland 2018, by encouraging the public to show their support with free online voting from noon on Wednesday 25th of July until noon on Tuesday 21st of August via the website. The prestigious competition is run by the Restaurants Association of Ireland, which has a total of 10 destinations vying for the honours, including Galway, Kinsale, Sligo, Armagh, Monaghan and Glaslough, Cavan, Boyne Valley, Kilkenny and Mid and East Antrim Borough. The Foodie Destination Ireland award recognises a destination that actively promotes itself through activities such as food festivals, gourmet trails or farmers’ markets as well as great dining experiences. To vote for the city in the Foodie Destination Ireland 2018, click here.